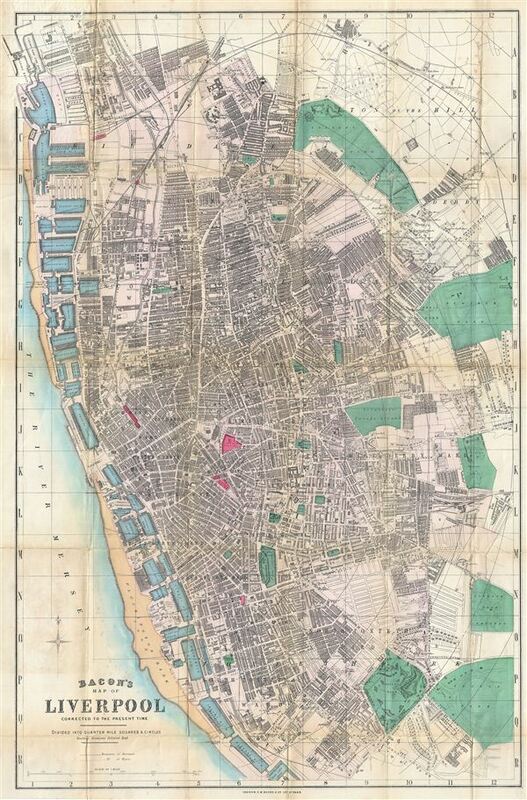 This is Bacon's scarce c. 1885 travellers pocket map of Liverpool, england. Cartographically Bacon derived this map from the Ordinance Survey with embellishments including quarter mile grid and square segmentation, beautiful hand tinting, and a focus on the identification of docks, rail stations, churches, municipal centers, parks, and other important buildings. Notes all streets and city wards. Parks are highlighted in green, docks in blue, sandbars in yellow, and transportation hubs in red. Published form C. W. Bacon's office at 127 Strand Street, London. Nineteenth century Liverpool was a bustling port city through which nearly 40% of the world's trade passed. Construction of major buildings throughout the city reflected this wealth. In 1830, Liverpool and Manchester became the first cities to have an intercity rail link, through the Liverpool and Manchester Railway. The population continued to rise rapidly, especially during the 1840s when Irish migrants began arriving by the hundreds of thousands as a result of the Great Famine. By the late 19th century, Liverpool's economy was drawing immigrants from across europe. Very good. Backed with linen. Minor wear on original fold lines. Comes with original linen binder.